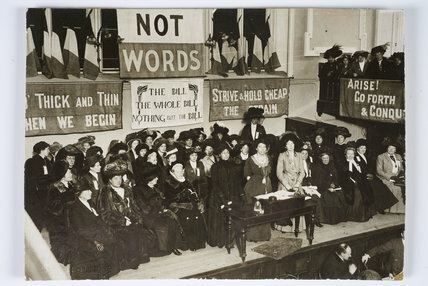 The Suffragette leaders addressing supporters at a meeting held at Caxton Hall on 'Black Friday', November 1910. Following the meeting the Suffragettes marched to the House of Commons furious at the delays to the Conciliation Bill passing through parliament. The resulting riot ended in the arrest of 115 women and four men. Many of the protestors suffered violence, intimidation and even acts of indecency at the hands of the police. One suffragette noted 'Several times constables and plain-clothes men who were in the crowds passed their arms round me from the back and clutched hold of my breasts in as public a manner as possible, and men in the crowd followed their example.....My skirt was lifted up as high as possible, and the constable attempted to lift me off the ground by raising his knee. This he could not do, so he threw me into the crowd and incited the men to treat me as they wished'. After the violent events of Black Friday the WSPU changed their tactics. Large deputations were considered too dangerous and it was decided to wage a more underground form of 'guerrilla warfare' against the Liberal Government.